This page summarises my professional and personal networks, roles and affiliations, revealing some of the responsibilities and influences that shape my thinking. Since September 2007 I have been the founding Editor-in-Chief of Wiley Interdisciplinary Reviews (WIREs) Climate Change, whose first issue was published in January 2010. From 2003 to 2009 I co-edited with Neil Adger and Kate Brown the journal Global Environmental Change. I remain on the editorial board of GEC and am also on the editorial board of the journals Environmental Science and Policy (from 2010), Transactions of the Institute of British Geographers (from 2013) and GAIA – Ecological Perspectives for Science and Society (from 2014). I have previously served as an editor for the journals Int. 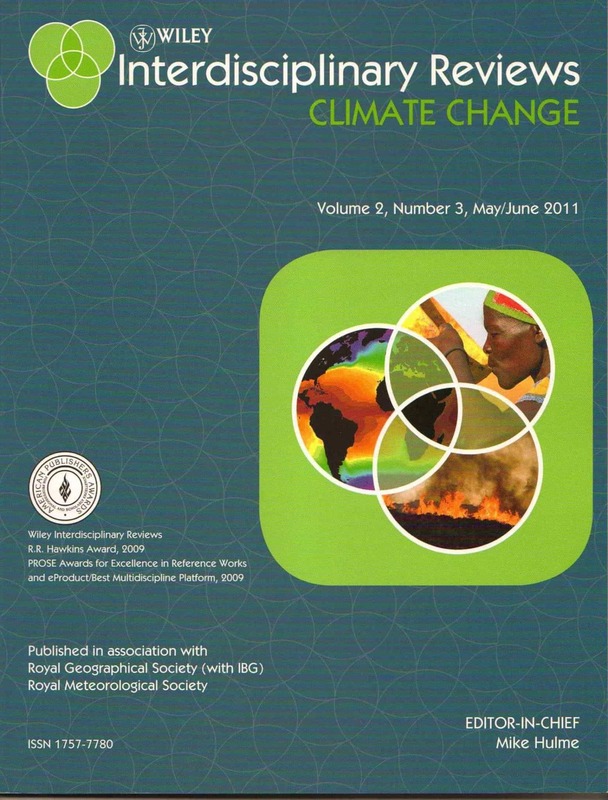 J. Climatology, Climate Research, Progress in Physical Geography and Climate Policy. I am a Fellow of the Royal Geographical Society (with IBG) and a member of the Science and Democracy Network, which seeks to enhance the significance and quality of scholarship in science and technology studies (STS). I am an Honorary Research Associate of the Making Science Public Programme in the School of Sociology and Social Policy at the University of Nottingham. I was also a member of the Nested Networks (NESNET) programme (2009-2012), which explored novel forms of governance for transnational nested networks, co-ordinated by the Helmholtz Center for Environmental Research in Leipzig. I sit on the Advisory Board of the EU-funded Innovative Training Network (ITN) ENHANCE, coordinated by the University of Leeds, which seeks to promote environmental humanities in Europe through strengthening graduate students’ learning and networking. I also am advisor to ‘The Seed-Box’, an environmental humanities collaboratory, based at the University of Linkoping in Sweden, and funded by MISTRA and FORMAS. Since 2010 I have been a member — and since March 2014 was the chair — of the Advisory Board of the STEPS Centre at the University of Sussex. From 2012-2016 I was an External Advisor to the EU FP7 funded ECOPAS Network, the European Consortium for Pacific Studies. I was a member of the commissioning panel for the AHRC’s 2010-11 network programme ‘Arts and Humanities Approaches to Researching Environmental Change’. From 2009-2013 I acted as expert reviewer for the European Research Council, sitting on their Society and Environment panel. From 2007-2011 I was on the Advisory Board of the UK Climate Impacts Programme and was a member of the advisory panel for the London Science Museum exhibition ‘atmosphere: exploring climate science’ (2010-2015). From 2007-2010 I was a senior advisor to the British Council, from 2002-2007 a member of the Scientific Advisory Board of the Potsdam Institute for Climate Impact Research and from 2004-2008 on the Advisory Board of the UK Energy Research Centre. I provided scientific input into the Conservative Party’s 2006 Quality of Life policy review. I was a Convening Lead Author for the scenarios chapter for the IPCC Third Assessment Report, as well as a Lead Author and Review Editor for other chapters. I was also the Manager of the IPCC Data Distribution Centre between 1997 and 2002. I was a Fellow of the Royal Meteorological Society from 1982 to 2002. I am a signatory to the Oxford Declaration ‘Science and faith unite on biodiversity’ under the auspicies of the James Martin Institute, issued 7 December 2007. I was a member of the British Labour Party between 1990 and 2016. I am an evangelical Christian and member of the Church of England, and my theology is broadly aligned with that espoused by Fulcrum, a movement seeking to act as a point of balance within the Anglican Church. See here a Christian appreciation of Charles Darwin. My own reasons for Christian belief are briefly accounted for in the New Statesman article on religious belief in science and public life from 20 April 2011 (my entry is the last one). In 2006/07 I studied for a postgraduate Diploma in History at the University of East Anglia. I am a member of the Society of Authors and of the Liverpool and SW Lancashire Family History Society. I have been married since 1987 and have a 1992-born daughter. ← Climate change: one, or many?